Most hard drives come “preformatted” and ready to use these days. But you occasionally might need to format one yourself. For example, formatting typically removes most of the data on a drive, making it a quicker way to erase a large drive than simply deleting everything on it. The biggest reason for reformatting, though, is if you want to change the file system used on the drive to something else. Windows makes several file systems available to you—including FAT32, exFAT, and NTFS—and they all have their advantages and disadvantages. While you’ll typically use NTFS for internal drives on a Windows PC (and, in fact, you’re forced to for your system drive), choosing a file system matters more when you’re formatting an external USB drive. Note: Formatting using most format utilities does not technically erase your drive. Instead, it marks the space your data used as available for writing to. So while you could still recover data from drives that have been formatted using the technique we’re discussing here, it requires a special utility and some time. For practical purposes, you can consider the data gone when you format a drive. If, however, you need to securely erase the data from a drive—say you’re tossing the drive or giving it away—consider a third-party tool like Eraser or DBan. Fortunately, Windows makes formatting drives pretty easy. You can format a drive—and perform other functions like creating and deleting partitions—using Windows’ Disk Management tool. But if formatting is all you want to do, there’s an easier way. Open File Explorer to the “This PC” view so that you can see all your drives easily. 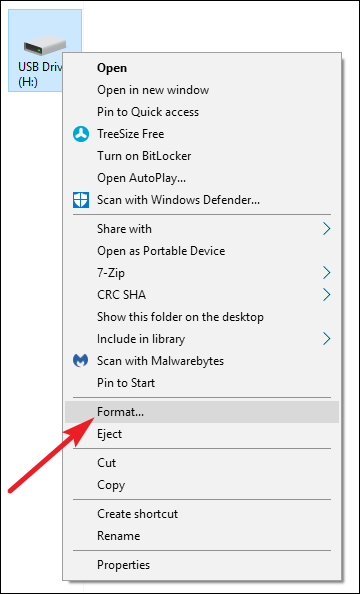 Right-click any drive in File Explorer, and then click the “Format” option. Capacity: This box shows the capacity of the drive. The dropdown shows only the drive you selected, so there’s not much to do with this option other than make sure you’ve got the right drive selected. File system: Depending on the size of the drive you’re formatting, you’ll see a few options here, including FAT32, exFAT, and NTFS. If you’re formatting a drive over 32 GB, you won’t see the FAT32 option here, but we’ve got a guide to help you work around that if you need to. Allocation unit size: The allocation unit size represents the maximum cluster size on a drive—the smallest units into which data are broken. We recommend leaving this value at its default of 4096 unless you have good reason to change it. 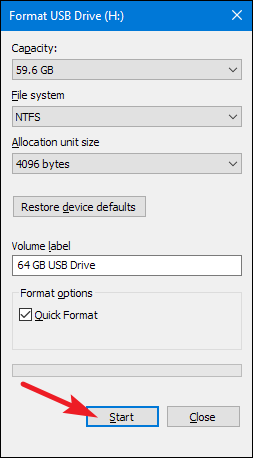 Restore device defaults: Use this button to change all the options in the “Format” window back to the default for whatever drive is selected. Volume label: Type a name for the drive as it will appear in File Explorer. RELATED: What is the Difference Between a Quick and Full Format? Quick format: Select this option to perform a high-level format, which works quickly and just readies the drive with a new file system. Clear this option to perform a low-level format that takes longer, but checks out every sector of the drive. A low-level format is a good option if you’re concerned about the reliability of the drive. When you’ve got all your options set the way you want them, click “Start” to continue. Remember, this will erase the entire drive, so make sure you have anything you need backed up! Windows warns you’ll lose any data on the drive you’re about to format. Click “OK” to start the format. When it’s done, you’ll be able to access your newly formatted drive in Windows.